Sick of the same old fundraisers? Do you dread having to ask friends and family to buy overpriced wrapping paper? Why not suggest a new fundraiser? 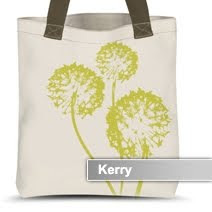 Virescent Shopper bags are a beautiful, eco-friendly alternative that your friends and family will feel good buying. I was given the opportunity to review the Hono-loo-loo Virescent bag at left and I love it! The bag is so nice, I've actually carried it as a purse! 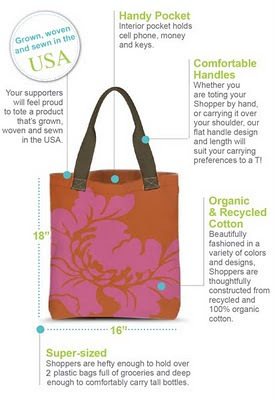 It's the perfect carry all for all your everyday items, or as a grocery bag or beach bag! And you can even add your school or sports team name to customize for your fundraiser! You can even do your fundraising in a variety of ways: taking orders via sign up sheet, (i.e. the traditional way) by opening up an online store, or by buying wholesale and selling at a price you determine. Check out more details about selling Virescent Shoppers at your next fundraiser! Virescent Shoppers are constructed from recycled and 100% organic cotton, and are beautifully fashioned in a variety of colors and designs. Because form and function really do go together, our reusable bags are sturdy enough to hold the equivalent of at least 2 plastic bags of groceries, plus have a handy pocket for cell phone, money and keys. Your supporters will feel proud to tote them around the market, mall, or library, especially because they're grown, woven and sewn in the USA. Verdict: I love my Shopper and have really enjoyed bringing it everywhere with me! It holds everything I tote around with me for the day (and then some! ), the straps are comfortable to wear on my shoulder, and the colors are vibrant and fun! And it definitely gets noticed (how could you not notice a beautiful bag like one of these!?) I will definitely be recommending Virescent Shoppers to friends and family! Win it: One lucky Frugal & Fabulous reader will win their very own Virescent Shopper! *Your least favorite fundraiser (or) tell me your favorite style Virescent Shopper! 1. Enter one of my other current giveaways and come back and tell me which one you entered! *Updated* You have until Monday, January 24 @ 7pm EST to enter! (Winner must respond within 48 hours.) Giveaway open to U.S. residents only. And, my least favorite fundraiser is the fundraisers that come home with the same exact items you can buy at the Dollar Store for 10x the price! I understand helping out my childrens school, but I am sure they can find something better for me to buy to help the school out!!! I really like the Capri Teal. This is a great fundraising idea!Thanks! My least favorite fundraiser is all of them! Everything seems over priced but you are guilted into helping the kids. My least favorite fundraiser is the baked goods. It is cheaper to make the cookies/crumb cakes/pies than buying them from a fundraiser. But it is for a good cause. I love the Jupiter in Orange. my least favorite fundraiser was selling these golf booklets (for different % off a round of golf or membership etc) my sophmore year of HS! It was pointless unless you know a ton of golfers! I knew 1...yippie! 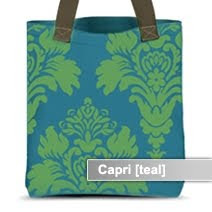 I like the capri teal bag. So great! Fav style Virescent Shopper = Sydney! i love the shannon and the jupiter bags. Least favorite fundraiser: girl scout cookies...there I said it...they're overrated. My least favorite fundraiser was one where the person raising the funds would give the donator a scratcher that they had to scratch off. The amount that was revealed after they scratched off the card was the amount the person had to donate. My least favorite are the magazine fundraisers. Seems those don't garner a lot of sales. Thanks. I love the mommy and me combo. 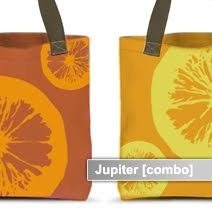 Aline R, arobimom at gmail dot com, the Jupiter in yellow is my favorite design. 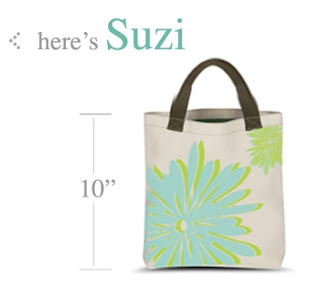 I like the Suzi bag in the Nature style. Thanks! My least fave fundraiser is for my kids to do anything frozen! I hate tracking down people to keep it out of my freezer!! I like the new sport sack! Thanks! Our least favorite fundraiser HAS to be selling cookie dough. Ugh. You have to carry around or store the frozen dough and it's over priced so no one really buys it! ha ha. We’d love for you to come by and enter our huge giveaway that ends 1/22! 4 packages worth $69-$89 each! Love, love all of the bags...what a great fundraiser..my drill team booster club will be seeing these! Least favorite fundraiser: frozen food..have been stuck several times when parents did not pick up as directed... and trying to scramble around to find enough freezer space for 8 cases of frozen food was no easy task!